I meant to share this back in June, but of course so many things were happening. I was conferencing like a fiend, researching, and finalizing my new job status! On top of that, Vish and I were visiting pre-schools for Ella. Afterwards, summer hit, and all I could think about was fiscal close procedures at work and how to plan for Ella’s birthday. So with all of that finally behind me, I’ve now have a tiny bit of relief in my schedule and am trying to get back on the horse with blog posting. Some of you might remember that back in May I co-moderated and organized a panel at Barnard College about women in the rock and metal music scene here in NY. It was panel born out of my thesis research. And although I posted about the wonderful shout-out we got from the online magazine, The Tempest, I wanted to share the recording that my husband did of the event. So without further ado – here’s Part 1 and 2 of Women in Rock and Metal Music. Disclaimer – In Part 1 you can hear a bit of my daughter’s babble, but it’s only for about a minute and half. I was glad to see folks enjoy our talk and get insights into the work we do. Hopefully this can become something we do annually! And here’s some photos from the slideshow I put together of our panelists (some photos courtesy of Justina Villanueva). Unfortunately, Kristen Korvette wasn’t able to make it. 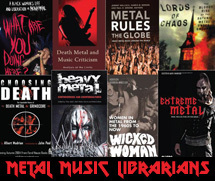 Join the Barnard Library for a lively discussion on gender, race, violence, and acceptance in the NY rock and metal scene with panel speakers Mindy Abovitz (Tom Tom Magazine creator/editor), Kristen Korvette (creator of feminist website Slutist), Laina Dawes (author of ‘What are you doing here? A black woman’s life & liberation in heavy metal‘), Justina Villanueva (photographer & artist), and Cristy Roads (punk musician, zinester, & artist). Moderated by Columbia University librarian and metal scholar Joan Jocson-Singh, and Barnard Library’s own performing arts librarian Charlotte Price, this event is open to everyone. Check out the Facebook event. Many thanks to Justina for designing this web flyer! Rock and Metal Moms Research Study!